How To Automate Your Pinterest Traffic: Tailwind SmartLoop! You are here: Home / Pinterest Tips / How To Automate Your Pinterest Traffic Safely: SmartLoop! Disclosure: I’m a Tailwind affiliate and will make a referral fee if you use my link – at no cost to you! 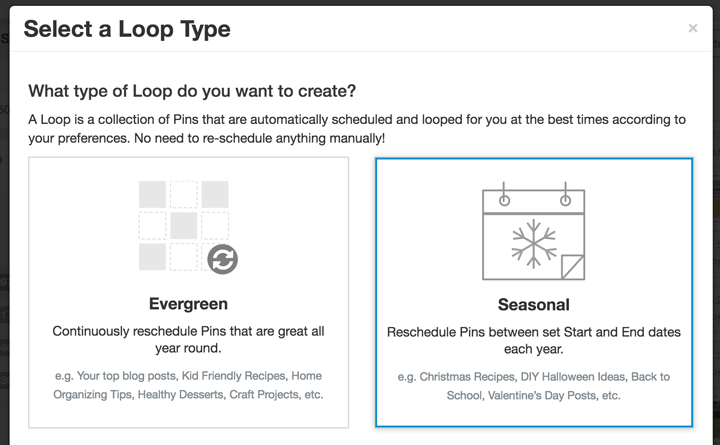 Pin Looping means you schedule Pins to a set of Pinterest boards you choose. Once the Pins have posted to each board, they’ll recycle and start posting again. 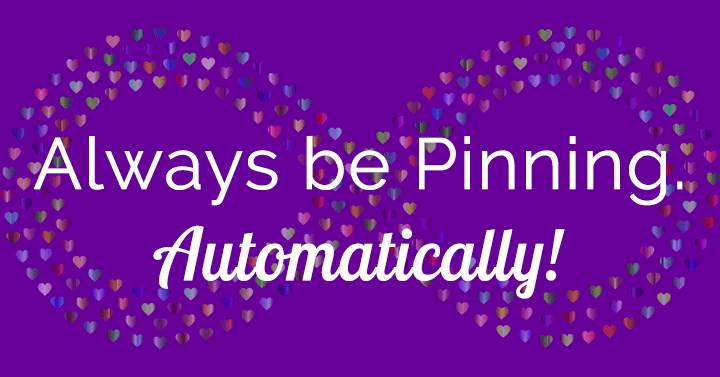 This means your Pins get a second, third, and more chances to be found on Pinterest – and send traffic to your website or online store! And, this is perfectly approved by Pinterest (see point 17 here). It’s a terrific time saver, and business booster! I’m a huge proponent of automating whatever business tasks you can. Your time is limited. You want to spend it wisely. While I personally believe any time spent saving your content to Pinterest is time well spent, once you have enough Pin images (I’d say maybe 20), you want to make sure you’re posting them to Pinterest regularly. Without being chained to your computer or phone! And most importantly, without risking your Pinterest account. Stay active on Pinterest with the least effort. Pinterest says consistent activity is vital for them to recommend your account! Customizable limits so you don’t share the same Pins too often or break group board rules. Maximize engagement on your content by republishing it. Reduce, reuse, recycle! Stats that show how your Looped Pins are performing. Keep looping them or tweak them! Stay relevant with Seasonal Loops that automatically serve up timely content. New Pins added to Loops are automatically prioritized. Previous Pins shift to later slots. 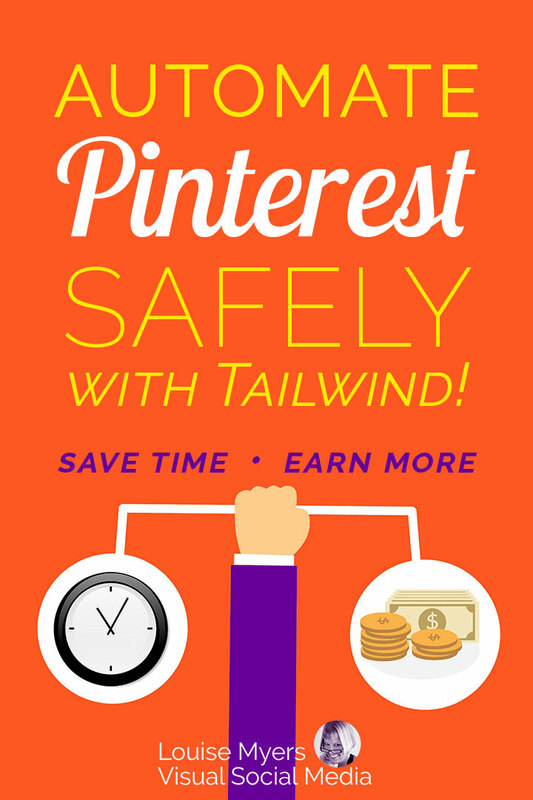 Tailwind is an approved Pinterest Partner. They play by the rules and keep your account safe. Not to mention, since their team has connections at Pinterest, they’ve even gone to bat for their users that have had problems on their accounts, like stolen Pin images. These guys have the right connections, and use them to safeguard your account. If you’re a former BoardBooster user, this is for you. If not, you’ll get an overview of how SmartLoop works! For Frequently Asked Questions, skip to this section. Or click here to jump to the full video tutorial. 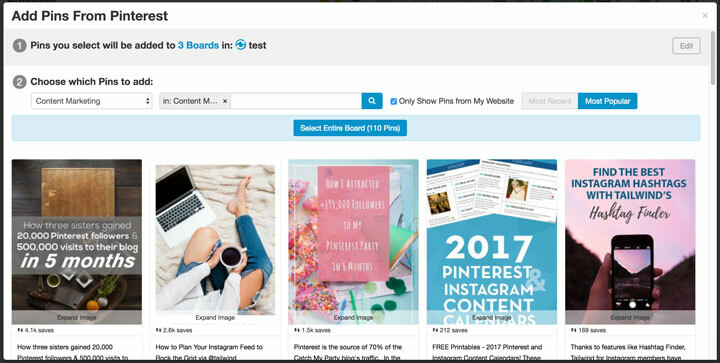 BoardBooster Campaigns source Pins from any Pinterest board and save them out to multiple boards as Repins. Pinterest recommends against repinning your own content, and does not approve of this method. With Tailwind Board lists, you can schedule a fresh Pin of your content from any of your own Boards to any of your other relevant Boards. This control is key, since saving Pins to irrelevant boards can hurt the distribution of your Pins. Another advantage to scheduling with Tailwind is that when you are saving your own content to Pinterest, you always save a fresh Pin, never a Repin. Repins of your own content do not count as engagement or prompt Pinterest to distribute your content more widely. Always save “fresh Pins” with Tailwind! BoardBooster Looping takes Pins from one Board (not necessarily your own board), and circulates Pins already on the Board back to it again as Repins. With Tailwind SmartLoop you can be much more discerning. It allows you to create a Loop of hand-selected Pins from your own Boards, Secret Boards, or Group Boards. You can import an entire board with the “Quick Add” feature, or filter to quickly select only those Pins that go to your own website, or those that contain a certain keyword or hashtag. Brilliant! SmartLoop even shows you the most engaging Pins on the Board so you can decide which to Loop, and which might need a new image or description before you Loop. Just remember that when you add a newly-created Pin to the board, you’ll need to add it to SmartLoop as well. Using Tailwind provides the perfect opportunity to look at the powerful analytics built into SmartLoop. You can see how each Loop is doing and how each Pin within each Loop is doing, with the ability to sort the best and the worst performing. 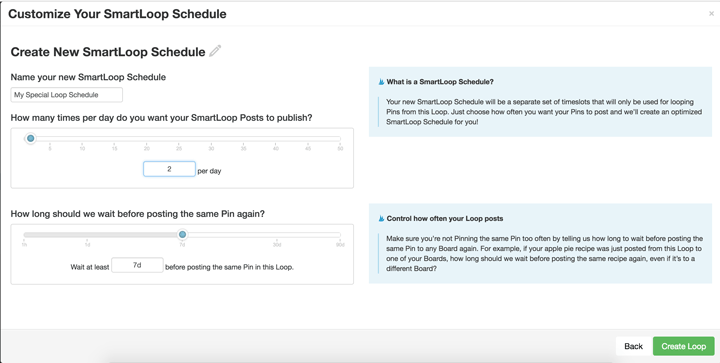 With SmartLoop analytics, you can refine your looping strategy by removing underperforming Pins, changing out descriptions or hashtags on faltering Pins, and replicating your successes by designing new Pins like those that consistently perform. Then add those to the rotation! Don’t forget those holiday Pins that drive traffic year after year – but only from October through December! Load your holiday Loop with those Pins and set your desired start and end dates for the upcoming holiday season. Be sure to create Seasonal Loops for holidays like Valentine’s Day, Easter, and Halloween. Check out the free Pinterest Planner for even more holiday ideas! Remember to add in anything new you create this year. Your Pins will go out to followers right when they’re looking for them this year, next year, and for as long as you like! NOTE: The calendar displays the year, but the loop will repeat annually. How do I guarantee regular sharing activity to a Board? For instance, if I want to make sure a Board gets two Pins per day, how would I do that? 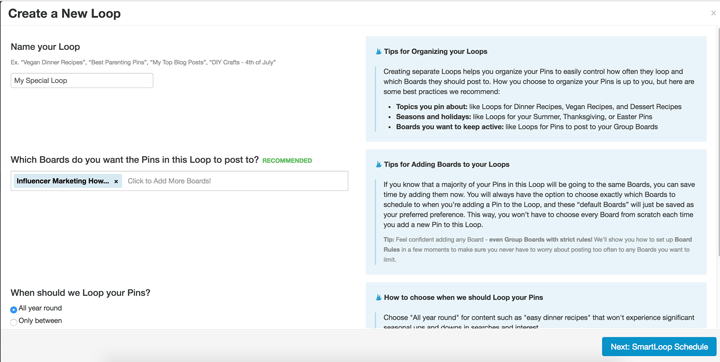 Use SmartLoop to create a Loop for that one Board and give it a new schedule that will add two Pins per day. Remember, though, that overall account activity is what Pinterest cares about, so if you have a seasonal Board, it may not make sense to save to that Board year round. Just remember to go in and freshen up your Loop content from time to time, adding in new Pins you’ve created. You can do this in one click through the regular Tailwind scheduling workflow. How do I make sure I don’t violate Group Board rules? Setting up Board rules in SmartLoop is easy! And you’ll never have to worry about your SmartLoop breaking the rules, even if the Group Board is included in more than one Loop. Do remember, though, that Pinning manually or adding Pins with regular (non SmartLoop) Tailwind will save additional Pins to those Group Boards. How do I add my new content to an existing SmartLoop? Simply visit your new blog post and use the Tailwind browser extension. Pull up the image and description to Pin. Select the Loop (or Loops) you want to add it to. How will I Pin other people’s content? To share other people’s content, you can schedule that to the General Queue instead of a Loop. If you install the Tailwind browser extension, it’s easy to schedule Pins as you find interesting articles online or right from Pinterest. No matter the case, when your Pin goes from Tailwind to Pinterest, it is always a fresh Pin, never a Repin. Where can I find high-quality content to Pin from other people’s websites? Pinning consistently often requires that we share other people’s content. But it can be a time-consuming task to search for and vet content for quality. Add your favorite websites to the Tailwind RSS feed of Pins for your account. Use Tailwind Tribes, and get shares for your shares! Save time on content curation, find content collaboration opportunities, and get more shares for your own content with Tailwind Tribes. Tribes are groups of like-minded business owners, bloggers, and marketers who add their content into a Tribe and then share out other people’s Pins. When you’re in Tribes with people whose high-quality content is relevant to your followers, you can schedule a week’s worth of Pins in about an hour! You’ll add these to your General Queue instead of a SmartLoop. An important note: Unlike BoardBooster Tribes, Tailwind Tribes will not force Tribemates to share Pins, and Pins do not need to be upvoted to be added to the Tribe. Instead, Tribemates come together to curate quality content together and thereby help each other learn and grow. Focus on sharing quality and relevant content to each Tribe you join. Share out what you think your followers will engage with. How can I automatically delete underperfoming Pins? Pinterest confirmed: we should not delete any Pins, no matter how lousy! If you want to see how your Pins have performed, look at your Pin Inspector in Tailwind. For your SmartLoop Pins, check out your Loops and look at each Pin to see how it is performing. But, there is no need to delete any instances of underperforming Pins. Pins without engagement will NOT hurt your other Pins. Pinterest’s Head of Product Marketing, Sarah Hoople Shere, confirmed this in the following video clip. Rather than spending time deleting Pins, invest that time creating new content or freshening up your old content. How can I see and edit the content that’s going out in my SmartLoops? Visit your Loops to see how the Loop is performing and how each individual Pin is performing. Sort by the data that means the most to you. If some Pins are not performing, you might change the description (something that’s good to do for an SEO boost, too) or decide to remove it from the Loop to make room for the Pins your followers find more engaging. How much does Tailwind SmartLoop cost? I know this is important too! First off, a Tailwind Plus Plan is $15 per month, or $119.88 paid annually. You can schedule and post 100 Pins FREE before committing to purchase. The Plus Plan includes 250 looped Pins at no extra charge. 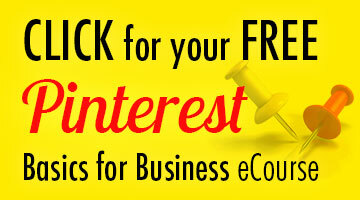 This means you can pick your best Pins and your best boards, and have those continually published at no extra cost. 1 looped Pin = 1 Pin to 1 board. So if you have 25 popular, money-making Pins, “loop” them to your 10 best boards. That makes 250 looped Pins and is included in the Plus Plan. After that (and once you see what a timesaver looping is! ), you can upgrade at the costs shown below. NOTE: prices shown are for a full year, at 50% off during the beta test phase! I’ve just started looping, but in all honesty, I expect to “Power Up” to the Unlimited Plan. That will run me $299.86 for an entire year of Tailwind plus automated Pinning. How much do you think it’d cost me to have a VA post 1,000 or more Pins a month for me? At least that much monthly! Compared to the value of my time, it’s a bargain. Tailwind vs BoardBooster: Make the Switch! It’s no secret: Everyone knows that I’m a huge fan of Tailwind. I’ve used Tailwind’s fab features for almost 3 years. It’s grown my Pinterest traffic and followers exponentially. I admit: I’m a rule follower too! So I love that Tailwind is an approved partner. But seriously, this is my business. No way am I risking 50,000+ website visits each month to a tool that breaks Pinterest’s rules – and could get my account closed. If you’re not already using Tailwind, sign up today. Look in your sidebar for SmartLoop and join the beta test phase! 250 looped Pins are included in your Plus plan. “Power Up” for more during the beta test phase and get 50% off! There’s currently a wait to try it. The sooner you sign up, the sooner you’ll get access! I’m told SmartLoop will open to public beta very soon. You can use Tailwind free until you’ve published 100 Pins. Smarter scheduling and resharing to Pinterest can save you time while keeping your account active, safe, and making sure your content gets to the people who will engage with it. Automate your Pinterest traffic safely – get Tailwind! Hi Louise, thanks for the heads-up. 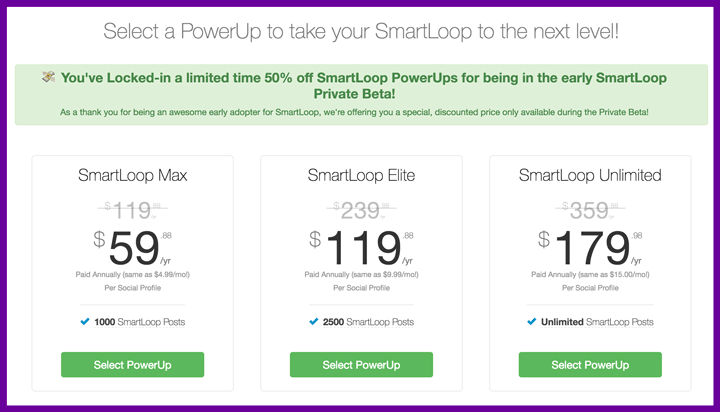 I just subscribed to SmartLoop beta program. Awaiting their input. I love automation and it’s a smart move from Tailwind to integrate it into their platform. It simplifies the workflow. Great! Hope you get it quickly. It’s always great to make our lives easier! Thank you for giving us the scoop about how SmartLoop works, Louise!! Any idea what it’s going to cost extra? As TW’s price keeps increasing for new features, I have to consider that it might be a better spend to promote pins than to pay for a scheduler at all. I don’t think they’ve decided yet. Some looping will be included in the Plus plan. I’m not sure if this is final pricing, but it’s $120/yr for 1000 looped pins, which should be plenty for most pinners. You’ll get a 50% discount if you Power Up during the beta test! 250 are included at no extra charge in the plus plan. Is that 1000 looped pins for the entire year!? Or 1000 pins a month? It doesn’t go by time period, but by number of pins set up in loops. They can repeat indefinitely. Can I just Louise you are awesome!!! I study everyone of your posts. I just started a blog 10 days ago and your advice on the changing landscape is always perfect! Thank you!!!!! I’m really excited about this because I’m a former Boardbooster user and loved their looping feature. I have clicked the “I’m Interested” button on Tailwind and filled out my data. How do we know when we are approved? I’m talking to them today so I’ll find out and let you know! When you’re approved, you’ll get a message in the Tailwind dashboard and by email. So does this mean that we should shut down our Boardbooster accounts and re work out pinning strategies. I have used Boardbooster exclusively, however this makes me really nervous. I don’t want to risk losing my Pinterest account. Thanks so much! I can’t say, all I know is Pinterest sent out an email that they were going after companies like BB that hack into their API. I have heard that BB is going to try to become a Partner but I’m pretty sure that a lot of what they do won’t be allowed by Pinterest. Thanks so much Louise. This is helpful and makes so much sense! Even if BoardBooster became a partner they’d likely have to change the functionality. For example, I know Pinterest doesn’t allow direct repins via their marketing developer API. Thanks again! What device are you using? I’ve already adjusted for several devices but if I don’t know what you’re using and seeing I don’t know what to fix. Thanks! Another amazing article that you have written. 1) Deletion of duplicates, because after awhile your board will be crowded with a bunch of duplicates. 2) Viral pins “protection” from being deleted, you know when you are looping in boardbooster they have an option to protect Viral pins from being deleted. For what i have watched , tailwind will not delete any pin at all that will be looped isnt that right? or i am wrong? Another thing, do you know what are the different price brackets for the looping services? I believe in the beginning i will require around 2000 pins to be looped but in a few months that value will double at least since i am uploading a lot of content a create a lot of variations of the pins for each blog post. Tailwind will never offer a feature to delete pins because Pinterest says Don’t delete pins. Boardbooster is in trouble with Pinterest because they have many features that break their rules. The expected pricing is: 1000 pins $10/mo, 2500 $20, unlimited $30. Half off during beta test. Thanks for sharing this info. This makes me want smartloop now! I’m still waiting to hear back from Tailwind about whether I’m approved. Will definitely be referring back here to know how to use it when this happens. Great! It’s such an awesome feature. Enjoy! Hi Louise! Thanks for another informative post. 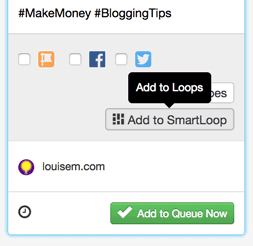 I’m wondering – do you ever add multiple different pins pointing back to the same URL in SmartLoop? What is a recommended number of looped pins per day, and best the frequency between pins? Thanks! I do. I prefer to put a post with many images into a separate loop so I can control how often that URL is pinned. You can have any number of looped pins. I have about 25 a day vs 5 scheduled pins. Cool! My other biggest challenge is making sure I’m not scheduling pins that are Smartlooped on the same day. It all feels so complicated to me right now! It is a bit complicated to set up, but once it’s done, such a huge time saver! The thing you can’t set is time between different Pins to the same URL. Tailwind assures me this isn’t an issue. So do you take note of which URLs are in Smartloop and stop scheduling those yourself because Smartloop takes care of it? Thanks for all your help BTW! I like that you pointed out that the loop will be able to schedule the best time for the preferences we have. I will try this kind of software so that I will be getting the right pins on time. This will be helpful since there are certain seasons that must be able to have the right posts on them instead of just letting everything scattered at the same time. Yes, it’s a great tool, and of course it’s important that you only use an Official Pinterest Partner tool!